Theoretically-based correlates of weight and waist circumference in an overweight/obese Hispanic sample were assessed. Two-hundred thirty-one participants completed questionnaires assessing constructs from self-determination theory and the transtheoretical model. Height, weight, and waist circumference were also measured. Hierarchical regression models predicted weight and waist circumference. Lower weight was associated with greater perceived competence for diet and exercise (β = − .176, p = .054; β = − .202, p = .040), environmental reevaluation (β = − .254, p = .009), reduced pros of weight loss (β = .246, p = .007), stimulus control (β = − .200, p = .054), helping relationships (β = .234, p = .005), and social liberation (β = .226, p = .019). Lower waist circumference was associated with the maintenance stage for exercise (β = − .304, p = .028). 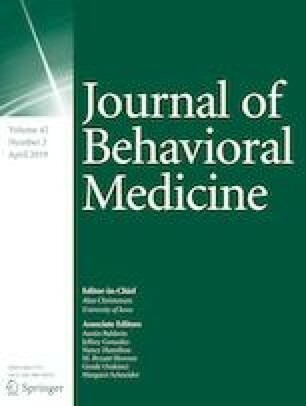 Exploration of the transtheoretical model and self-determination theory in relation to reductions in overweight/obesity within Hispanic populations is warranted. This research was supported by Grant Number 1 P20 MD002287-03 from the National Institutes of Health/National Center for Minority Health and Health Disparities (PI: Elias Provencio-Vasquez). Julie Blow, Ivan N. Torres, and Theodore V. Cooper declare that they have no conflict of interest. Adult Body Mass Index Chart (n.d.). Adult Body Mass Index Chart. Retrieved at https://lexingtonhealthdepartment.org/wp-content/uploads/2017/05/Body-Mass-Index-Table-with-feet-and-inches.pdf. Centers for Disease Control. (2016). Defining adult overweight and obesity. Retrieved from https://www.cdc.gov/obesity/adult/defining.html. Centers for Disease Control and Prevention. (2011). National diabetes fact sheet: National estimates and general information on diabetes and prediabetes in the United States, 2011. Atlanta, GA: U.S. Department of Health and Human Services, Centers for Disease Control and Prevention. Retrieved at http://www.cdc.gov/diabetes/pubs/pdf/ndfs_2011.pdf. Cousins, J. H., Rubovits, D. S., Dunn, J. K., Reeves, R. S., Ramirez, A. G., & Foreyt, J. P. (1992). Family versus individually oriented intervention for weight loss in Mexican American women. Public Health Reports, 107, 549–555. Retrieved from http://www.publichealthreports.org/. Domel, S. B., Alford, B. B., Cattlett, H. N., Rodriguez, M. L., & Gench, B. E. (1992). A pilot weight control program for Hispanic women. Journal of the American Dietetic Association, 92, 1270–1272. Retrieved from http://www.adajournal.org/. Foreyt, J. P., Ramirez, A. G., & Cousins, J. H. (1991). Cuidando El Corazon- a weight-reduction intervention for Mexican–Americans. American Journal of Clinical Nutrition, 53, 1639S-41S. Retrieved from http://www.ajcn.org/content/vol53/issue6/index.dtl. Marcus, B. H., Selby, V. C., Niaura, R. S., & Rossi, J. S. (1992). Self-efficacy and the stages of exercise behavior change. Research Quarterly for Exercise and Sport, 63, 60–66. Retrieved from http://www.aahperd.org/rc/publications/rqes/. Prochaska, J. O. & Velicer, W. F. (1997). The transtheoretical model of health behavior change. American Journal of Health Promotion, 12, 38–48. Retrieved from http://healthpromotionjournal.com. Weight Control Information Network. Do you know the health risks of being overweight? NIH Publication No. 07–4098; 2007. http://www.ajcn.org/content/vol53/issue6/index.dtl.